DETROIT — There was plenty of space for Erik Gustafsson to shoot the puck himself, but with Patrick Kane alone to the right of the net, his decision was obvious. “He’s a pretty good goal scorer, so I gave it to him,” Gustafsson said. 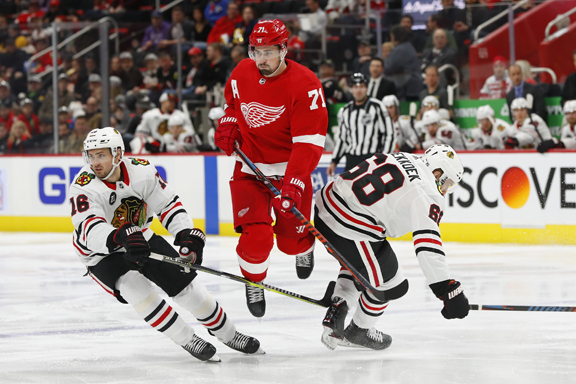 Kane’s second goal of the game, with 2:18 left in overtime, gave the Chicago Blackhawks a 5-4 victory over the Detroit Red Wings on Wednesday night. Kane extended his point streak to 19 games and helped the Blackhawks recover after blowing a 4-1 lead in the third period. Dylan Larkin and Andreas Athanasiou scored two goals each for the Red Wings, who tied it late in the third. But Kane fired home the pass from Gustafsson in overtime, beating goalie Jonathan Bernier for his 38th goal of the season. Artem Anisimov, Brandon Saad and Alex DeBrincat scored for Chicago in the first period. Anisimov made it 1-0 after only 99 seconds, but Larkin answered for the Red Wings a few minutes later. Saad scored his 21st goal of the season, and DeBrincat’s 33rd made it 3-1 before the end of the period. In the second, Kane came down on a 2-on-1 break with Jonathan Toews. Kane took the shot himself, beating Jimmy Howard to make it 4-1. Howard was then replaced, having allowed four goals on eight shots. Larkin brought the Red Wings within two with his 26th of the season, and Athanasiou made it 4-3 when he scored on the power play with 14:37 left in regulation. The Red Wings had their goalie pulled when they tied it with 1:26 left in the third. Mike Green appeared to mis-hit a shot from near the blue line, but Anthony Mantha corralled the puck to the left of the net and slid it across the goalmouth to Athanasiou, who had an easy shot from the other side.